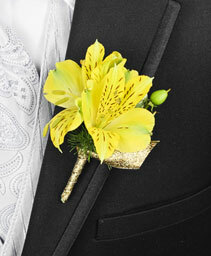 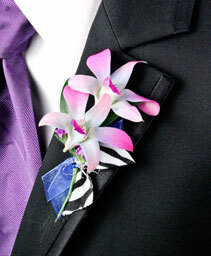 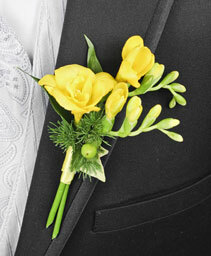 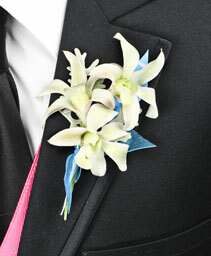 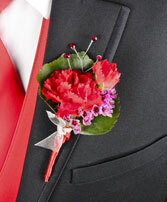 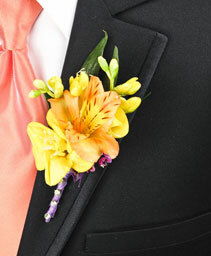 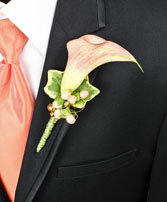 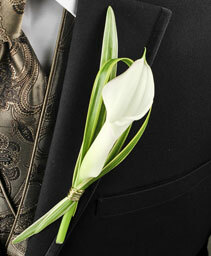 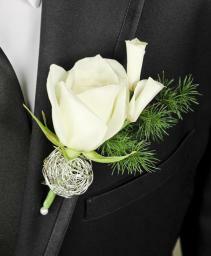 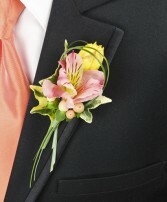 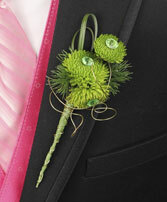 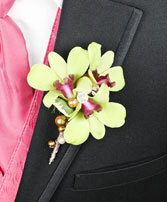 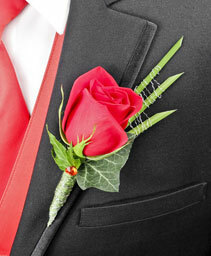 He's sure to stand out when sporting our beach-themed boutonniere. 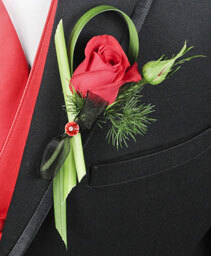 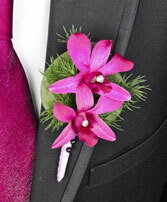 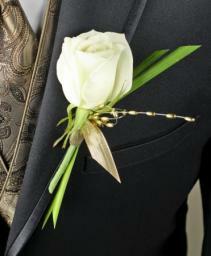 Whether you choose a green rose or a green Cymbidium orchid, each accented by bear grass, this arrangement is a stylish addition for him to wear on his lapel at proms, weddings or any special celebration. 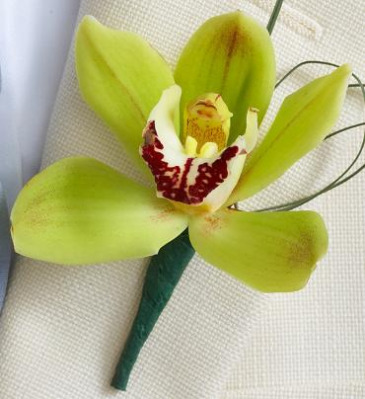 You can also choose our matching mini green Cymbidium orchid boutonniere, perfect for a ring bearer or any dashing young man. 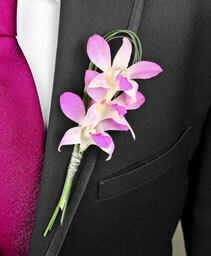 Price #1 is for a single orchid & Price #2 is for a double orchid. Different colors are available, simply give the shop a call to discuss availability. A crisp white Calla lily and variegated pittosporum are hand-crafted by our designers to accent their tuxedos with charm and elegance. With a classic burgundy Calla lily accented with seeded eucalyptus and variegated pittosporum, you can be sure that special guy will be looking sharp on his big day. 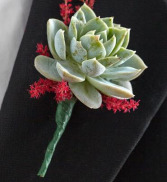 An inspired touch for proms, weddings or any elegant affair, each boutonniere is artistically handcrafted by one of our designers to make him stand out from the crowd. When you choose a unique fresh-cut succulent with pink astilbe, you can be sure that special guy will be looking sharp on his big day. 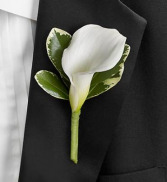 An inspired touch for proms, weddings or any elegant affair, each boutonniere is artistically handcrafted by one of our designers to make him stand out from the crowd. 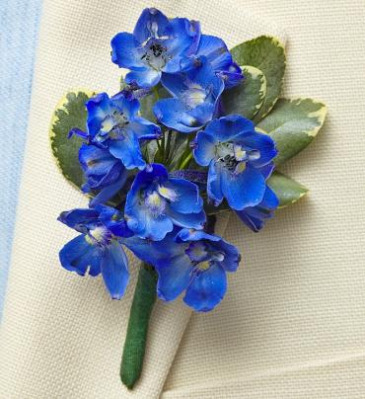 For a look that's sure to grab attention, choose our striking blue delphinium boutonniere. Perfect for prom dates or country-themed weddings, they're also a great choice for any special celebration that calls for a little rustic charm. 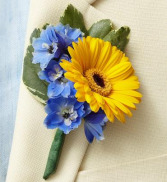 Fresh-cut mini boutonniere of yellow mini Gerbera daisy & striking blue delphinium with variegated pittosporum. 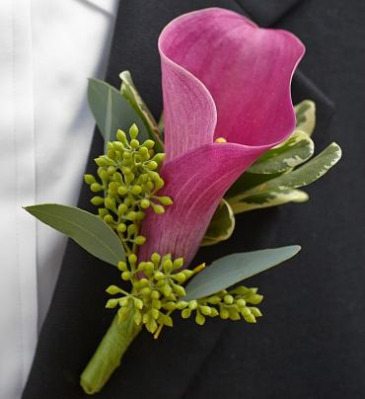 Perfect for prom dates or country-themed weddings, they're also a great choice for any special celebration that calls for a little rustic charm. 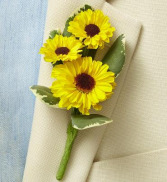 For a look that's sure to grab attention, choose our bright yellow mini Gerbera. Perfect for prom dates or country-themed weddings, they're also a great choice for any special celebration that calls for a little rustic charm. 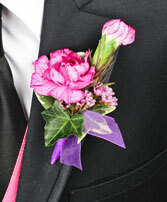 Available in different colors, simply call the shop to discuss availability.